Right after that stop skipping and overwrite save 1 (the first one was just to keep you safe, because the upcoming character selection screen doesn't let you save). Actually you can make another save after a minute, so you won't waste time waiting for the character screen. In the main menu select the fourth option and the blue guy (2nd from the left - ハルトルート), press right arrow once on D-pad and select third red column from the left (乱れる音). There are two choices here, select the left one to enter settings and slide top slider max left to 0, do the same for the 2nd slider (max left = 0), leave the third. From now on the left button will be called settings, the right story - this is done to get some additional endings needed for trophies. Back out with : and select the right option and skip to the end. In the menu select the fourth option and the blonde guy (3nd from the left -アルシェルート), srcoll max left and select third red column from the right (君がいる街). Settings: move both sliders max left. In the menu select the fourth option and the orange middle blonde guy (4th from the left -ディールート), srcoll max left and select third red column from the right (もう、逃げない). Settings - move both sliders max left. In the menu select the fourth option and the green guy (3rd from the right クラヴィアルート), srcoll max left and select second red column from the left (クラヴィア). In the menu select the fourth option and the purple guy (2rd from the right ヴィッセルート, press right arrow once on D-pad and select fourth column from the left left (偽りの自由). In the menu select the fourth option and here select the very first person (girl) from the left. All sliders on the left side max right (so you should see 5,5,5,4,5) and the Bad slider on the bottom right corner set to max right - 3. Now do the above again, but this time move all the sliders on the left side to 0 and the BAD slider on the right side to 0 as well. Back out and run the story to get a bad ending. In the main menu select 3rd option and you should see all lights on the slots here and than the drawer will open with some letter with column of short stories. Skip through al 7 of short stories to unlock a longer one on the right side of the same screen - start it. 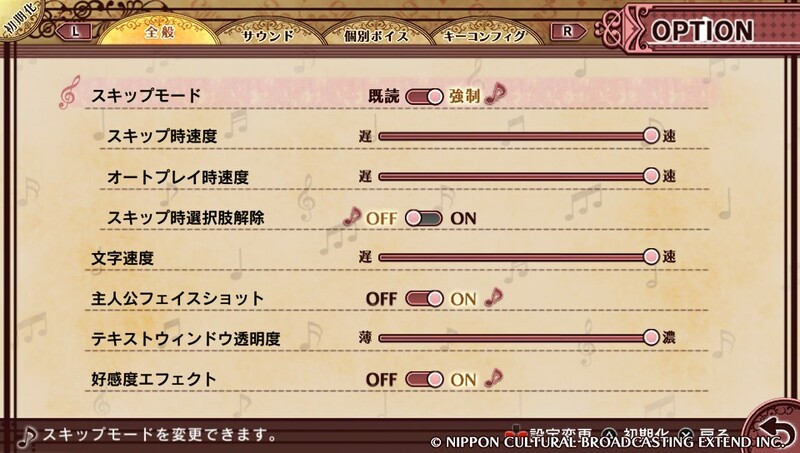 In the menu select the fourth option and gray guy on the very right (ハイリゲンシュタッの歌, press right arrow once on D-pad and select second column from the left (ハイリゲンシュタッの歌). There are two choices here, select the left one to enter settings and the only slider max left. Now we have all endings good and bad, as well as all CGs, enter gallery and select the first option (CG). Here view all 7 tabs (the tabs appear when you back out with x, you should see All 110/110 and below are the grey tabs). No need to open any pictures, just click the tabs and back out. The last thing you have to do is go to the store (select Extra in the menu) and buy everything there. You have the exact amount of crystals to buy everything here. So buy everything and your plat will pop here. Guide is completed as soon as RD adds the settings, this can be moved. Perfect guide Skroq thank you. And also RD for picture. Perfect guide bro, nice job! Thanks for the Guide. Everything worked the same way and got Platinum.